The Global Ultraviolet Imager (GUVI) is one of four instruments that constitute the TIMED spacecraft, the first mission of the NASA Solar Connections program. The TIMED spacecraft is being built by Johns Hopkins University Applied Physics Laboratory and GUVI is a joint collaboration between JHU/APL and the Aerospace Corporation. TIMED will be used to study the energetics and dynamics of the Mesosphere and lower Thermosphere between an altitude of approximately 60 to 180 kilometers. The most up to date calibrated products (calibration version 13, available here) will soon become the default data products. Details about the changes to the calibration and data products can be found here. The above link is about a paper describing possible real world impacts on communication due to irregularities in the ionosphere seen by GUVI. Nighttime ionosphere observations of Oxygen recombination emission in 135.6 nm (imaging mode) by GUVI can be used to detect "bubbles" in the electron density initiated by Rayleigh Taylor instabilities. 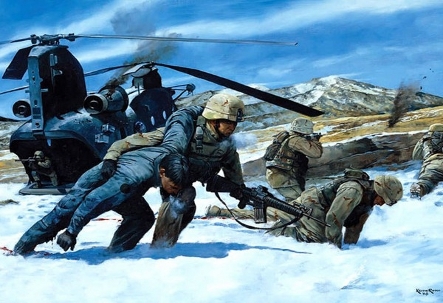 Analysis of GUVI data confirmed the existence of bubbles over Afghanistan during a military rescue operation that had radio difficulties with deadly consequences. 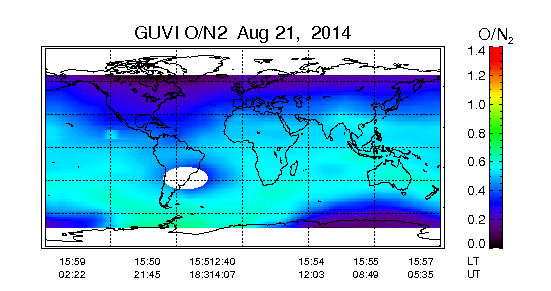 Better knowledge of ionospheric conditions from instruments like GUVI can contribute to more reliable communications. An illustration of the moving auroral boundary and increasing brightness in the Lyman-Birge-Hopfield Short (or LBHS) nitrogen band during the recent St. Patrick's day storm (2015). 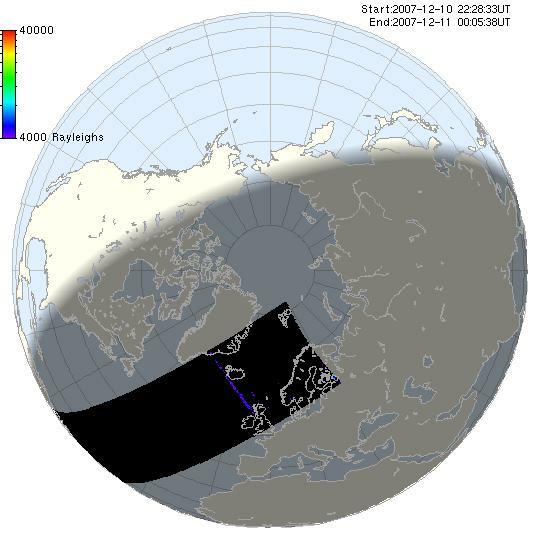 As the storm develops, the auroral boundary moves to lower magnetic latitude and the LBHS intensity increases due to a rising energy flux of particles in the northern polar region. The magnetic latitude of the auroral boundary is plotted with the black triangles. Also shown for comparison is the concurrent value of Dst (red triangles and red scale on the right axis). Times shown are in UT. The above link is to a paper about analysis of particle-induced noise that is seen in data from UV detectors like the one on GUVI. This noise is due to hits on the detector from MeV energy protons and electrons. 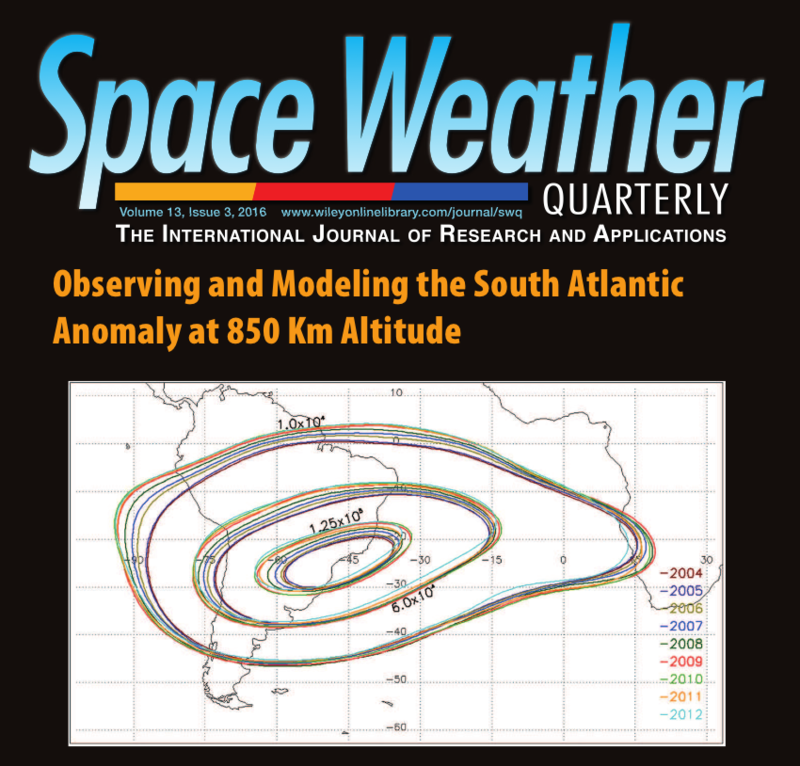 The noise is particularly apparent during passage through the South Atlantic Anomaly (SAA), and can be clearly seen in the new daily summary images from version 13 data. By isolating this particle noise and studying it, GUVI can help monitor the evolution of the SAA as the Earth's magnetic field changes over time.